The tranquil riverside location of Elaine and Terry’s pub may be the envy of their fellow local publicans, but unfortunately, they paid a terrible price for their stunning spot last winter, when during a period of heavy rain, the river flooded and did devastating damage to their precious pub. The damage was so bad, they had to close the place for months and have it completely renovated. Elaine, being the positive sort, said at least it gave her the chance to do the redecorating she had been nagging Terry about for ages, but jokes aside, the couple had undergone a lot of stress and expense to see their inn restored to its former glory. After a lot of hard work and sleepless nights, the day dawned when it was time to open the door to their punters again! Elaine and Terry wanted to show everyone that they had come back fighting, draw their regulars away from the other pubs they had been frequenting in the interim and remind them what they were missing! They were determined to make it a night to remember, and with their new kitchen still not fully functional, they decided to hire Hog Roast Bickley to provide one of our unforgettable hog roast feasts to mark the special occasion! When we arrived at the newly refurbished pub, Elaine was bustling about making sure everything was perfect. Having seen the flood damage for ourselves in passing, we were very impressed with the transformation and we couldn’t wait to help them show off their new and improved establishment by providing their guests with the highest quality locally produced food! Elaine wiped a discreet tear from her eye as they finally opened the doors again and she was in her element behind the bar as Terry was busy welcoming his patrons back as they flocked into the pub, all eager to see the fruits of the couple’s hard work. The Hog Roast Bickley team focused on the task at hand and stayed on the side-lines, to allow Elaine to have all the limelight she richly deserved. They were both beaming with pride as the guests tucked into our succulent pork and crispy crackling, accompanied by fresh seasonal vegetables and roast potatoes, all prepared by us in the restored pub! 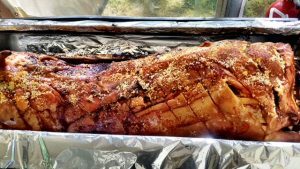 They thanked Hog Roast Bickley for our contribution to their long-awaited evening and we want to congratulate them for not only re-opening the pub but making it even better than it was before!